A fireball, thought to be a meteor, was spotted in the sky by people from all over the island of Ireland at about 1800 GMT on Wednesday. People in Armagh, Craigavon and Omagh reported sightings to the police, and it was also seen on the Glenshane Pass. The Northern Ireland Coastguard also took calls from people who believed the fireball had landed in Lough Neagh. In the Republic, Valentia Coastguard said it took calls about sightings in Counties Westmeath, Limerick and Cork. Joss Scott was driving along the Glenshane Pass when she spotted the fireball in the sky. "It was a very bright green, with an orange trail coming from it. "It was travelling at fantastic speed, very high up in the sky, and it was heading north. "It then went behind these black clouds over the Sperrins, towards Dungiven, then there was this large orange flash, so I'm not sure if it landed somewhere around there. "It was quite a spectacle," she said. 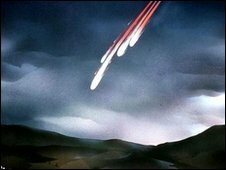 Terry Moseley from the Irish Astronomical Association said such an occurrence was "extremely rare" and said there was a chance that some of it may have survived and fallen to earth as a meteorite. "What it probably was is a small asteroid, which is a piece of space rock which has collided with the earth and burned up at very high atmosphere," he explained. "It seems to have travelled over most of Ireland, roughly from south to north and there is a possibility that a meteorite fell at the end of that, possibly somewhere in County Armagh." He said it was very important for anyone who saw it to report their sighting and suggested contacting either the Armagh Observatory or the Irish Astronomical Association. "We'll collate all the reports, and the more reports we get, the greater the chance of us recovering some of it, if it did fall. "It is pretty unusual that you would get one that is so widely seen, and that is so bright." Mr Moseley said there were "only about half a dozen" recorded meteorite falls in Ireland. "The last one was in 1999, and the last one in the North was in County Derry in 1969," he said.